We had a great fungus find last week. 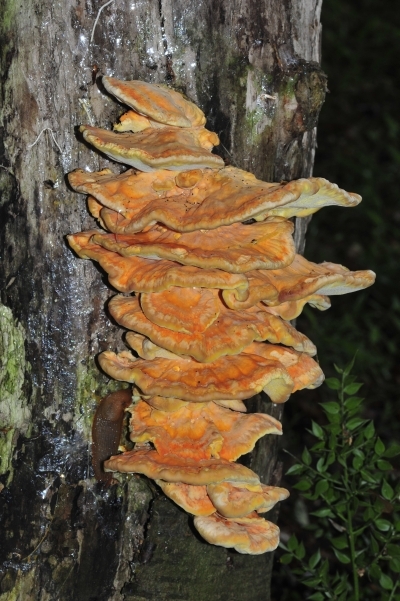 On a dead cherry tree at the border of the forest and our fields was this magnificent shelf of Chicken of the Woods Laetiporus sulphureus which we'd never eaten before although I did see some in another place in 2006 just after we arrived here. I didn't pick it that time and it disappeared very quickly so I think someone else must have had it. It's an easy fungus to identify, very distinctive and there's nothing horribly poisonous that looks similar. You can see the slugs are enjoying it too although slugs eat anything, even deadly fungus so that's no guarantee of safety. If you read about it on the web there are some (much repeated) warnings about allergic reactions. It's best to advise caution but I think the risk here is probably overstated and relates to the host tree wood as much as the fungus. I'd certainly not want to eat anything growing on Yew or Eucalyptus and suggest you don't either. 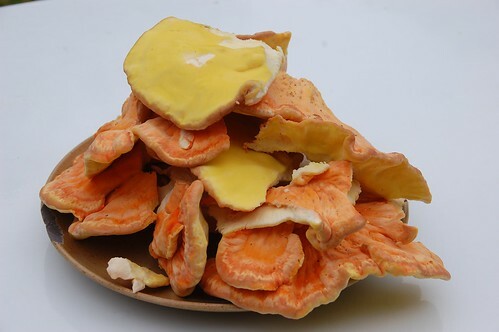 *** The other factoid cut and pasted about is that it's an especial favourite with the Germans but we couldn't find anything particularly Germanic either in enthusiasm or recipe form relating to it although the fungus hunters of Europe are in consensus that it's a welcome find. After harvest we had 1kg of nice young brackets, enough for about five meals for two. The first taste was just some strips fried in a mixture of sunflower oil and vegan margarine with a smidge of garlic and we were agreed that it is quite a chickeny flavour, as best we remember it, but the texture is a little more like dry old turkey. It's very good for all that. We also had some in a stew with white wine and other vegetables and some cooked and cold with a potato salad. I'd like to try it with paprika as I think the flavours would work well. I've put a bit away in the freezer as a test - the word is to fry it off in chunks and then it will freeze for three months or so. Not much of an extension of the season but worth knowing if you find an enormous amount. So this week I found some more, but here on my own wanted to save the best bits for the Mr. when he arrives for the weekend. I carefully prepped the beast and was left with the chunkier stump (for want of a better description) which I decided to stew. All seemed well but a few hours after eating it I got the most horrible nausea and sickness which has taken a couple of days to shift. Further googling indicates that although you won't die from it the harder inner parts of the fungus need extremely long cooking or the problems I had might occur. I shan't be trying this again, it was a horrible experience, but if you're tempted to use all of your haul make sure you cut it small and cook for at least an hour at a good simmer.